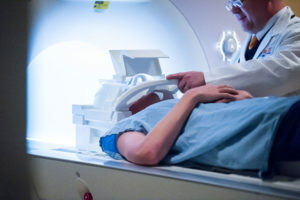 The UVA NeuroImaging Lab is comprised of researchers dedicated to advancing scientific knowledge, education, and training in the field of CT and MRI technology and advanced imaging techniques such as perfusion imaging, spectroscopy, diffusion tensor imaging, and functional imaging. Our areas of research interest include imaging of cerebrovascular conditions such as stroke and aneurysms, imaging of head and neck tumors, and imaging of patients who have suffered traumatic brain injury or who are affected with neurodegenerative conditions. The UVA NeuroImaging Lab has more than 1,000 square feet of space available on the clinical campus, within walking distance to the neuroradiology reading-room, and another 1,000 square feet of space available at the Fontaine Research Park. It comprises staff to provide administrative, computer and statistical support, as well as help with medical editing. It is equipped with 10 high-end processing workstations, directly connected to PACS and Internet.